Poor Carson Daly. 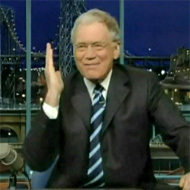 All week long, Letterman has delighted in mocking NBC’s fourth-string late-show host (“The Pluto of talk shows!”), which has still been funny, even if it’s totally just piling on. (Also, sort of unfair: Even at 1:30, Carson’s show occasionally ties ABC’s Jimmy Kimmel Live! in younger demos, even though Kimmel airs a full 90 minutes earlier, making Last Call one of the few overachievers in NBC’s lineup.) Here’s a highlight reel.